Filmmaker Mike Flanagan had a chance to show off his auteurship here, as he wrote and directed all ten episodes for Netflix of this third adaptation of The Haunting, the iconic 1959 Shirley Jackson novel. 1963’s Robert Wise film is the classic of course and cannot be topped (1999’s embarrassing attempt is better left forgotten), but for this new one Flanagan changed it by making it a story about a family instead of just crazy Nell (she’s one of the kids now). This time, a family of seven move into Hill House for a summer in the early 90’s, with the parents (Henry Thomas and Carla Gugino) intending to renovate and then sell the place, but big horror ensues of course. The show is structured a lot like This is Us, with flashbacks to that 90’s summer interspersed with present day scenes of the kids all grown up and variously damaged by their experiences. Each episode is centered around one of the kids, so they all get developed to a certain extent, but Flanagan is limited in his ability to write with depth. Each Crain sibling gets exactly one character trait to exploit over and over again (Luke the drug addict, Shirley the controlling one, Theo the psychic, Steven the judgmental one, Nell the unstable nervous one, etc). This is trick writing- hollow, surface level people masquerading as substantive. It wears very thin, very fast, especially when later episodes are marred by cheesy monologues and obvious storytelling tropes (the white Crain kids are conveniently paired with cardboard cut-out love interests of varying ethnicities- I see what you did there, Flanagan). On the bright side, there are some real scares on this show. Suspense is appropriately drawn out and infuses every episode (especially the flashbacks), and Flanagan’s filmmaking style (as opposed to his writing) is innovative for television, as you can see him experimenting with long takes, unusual staging and creative camerawork. 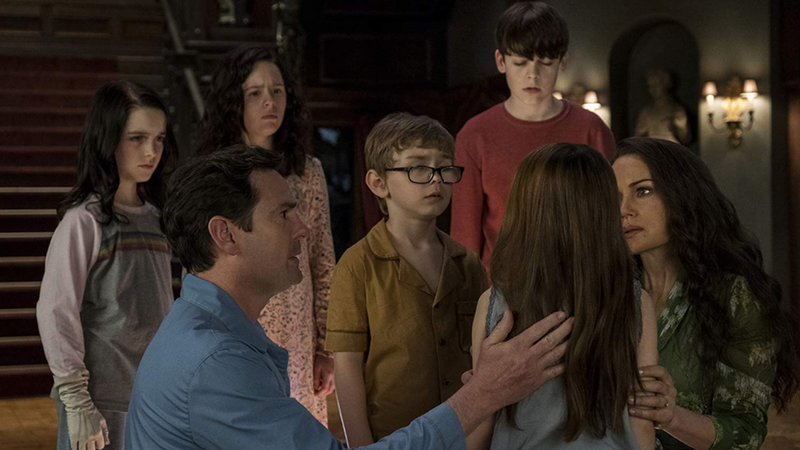 The acting is also stellar for the most part, with each Crain kid played very well by both their actors (this might be some of the best acting I’ve seen from multiple child actors in a long time), and Carla Gugino a true standout as the tormented mother who slowly loses her grip as the family’s stay in Hill House extends itself (Henry Thomas fares less well, with his older counterpart Timothy Hutton turning in a more finely tuned performance). The show peaks with episode five, “The Bent-Neck Lady,” a truly haunting and terrifying hour that works on both levels, the horror and the character drama involving the youngest Crain sibling (nicely played by Victoria Pedretti), the one named for the unstable main character of the novel, played by Julie Harris in the 60’s film version. It’s difficult to not want to recommend a series with so many genuine scares and a great episode like this, but the resolution in the finale goes so over the top into melodramatic cheese and seriously bad dialogue that it leaves off on an unfortunate sour note. Ultimately the forced melodrama feels inauthentic when it comes to the Crain adults not named Nell, and the comparisons to This is Us are accurate in that it’s mimicking that show’s unbearable sentimentalism. I could have easily done without all that, to be honest. The horror is good enough that I wanted more of it and less of these people arguing. December 27, 2018 by Ariel Shavonne.